December 2013 -- Don M.
Note from the Webmaster. 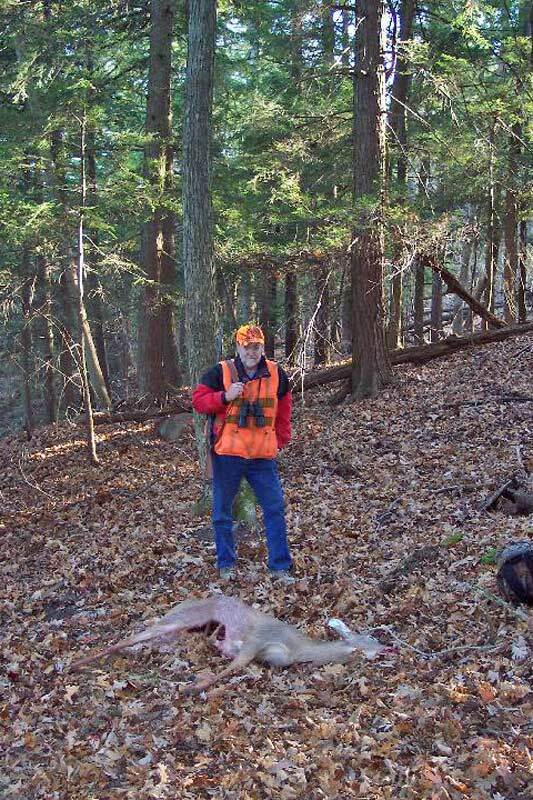 Don has been a regular contributor to the website and this year also sent pictures from his recent hunt in New York State. His mention that this was now a 40 year tradition piqued my curiosity and Don kindly responded with this story. 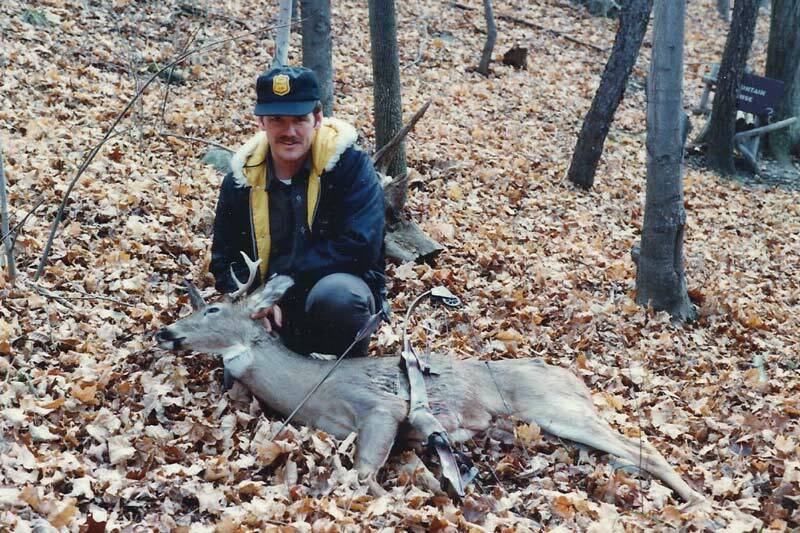 Here is a bit of information about deer hunting in NY State and a few memories of my deer hunting there. 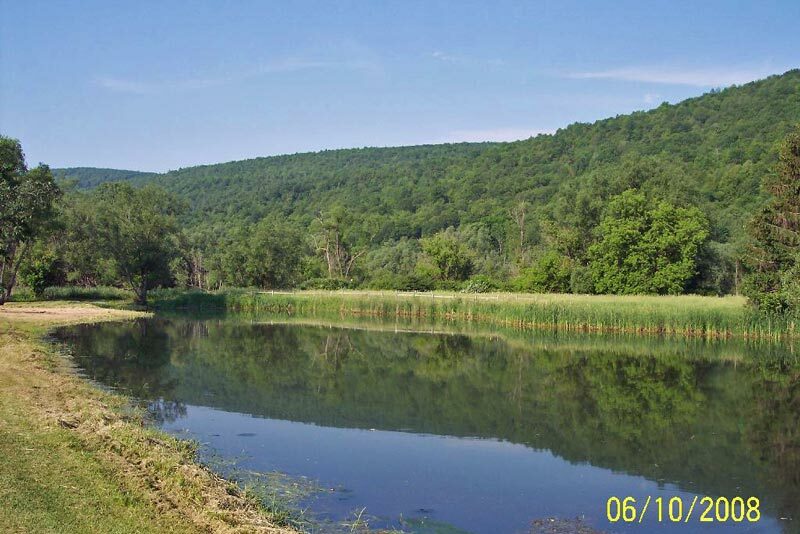 I first started hunting there primarily because my wife Cheryl is from Bristol, New York. We spent a fair amount of vacation and long weekends visiting her family there over the years. They live out in the country and owned about 110 acres when I first started going there in the early 1970s. 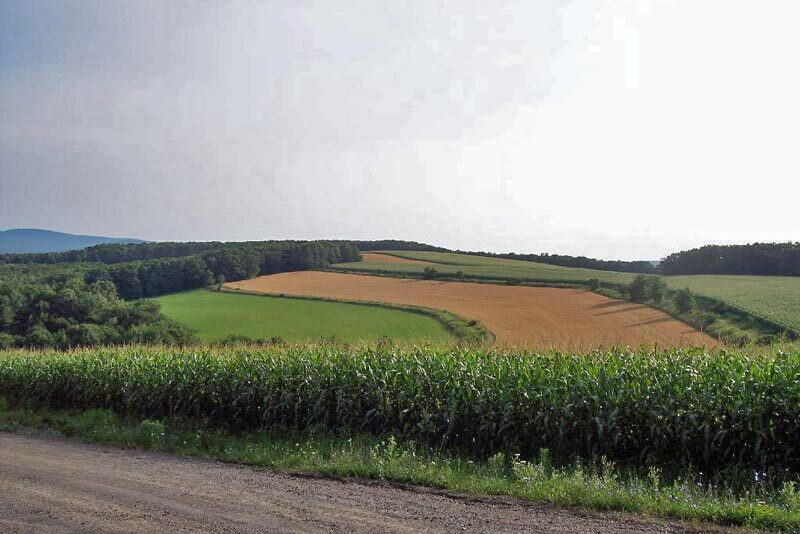 Their property, on one side, is bordered by what they call State Land. This is like Crown Land here and is for hunting, fishing, hiking, etc., by the general public. Deer hunting there was a way of life, in those earlier years, for a significant portion of the population. 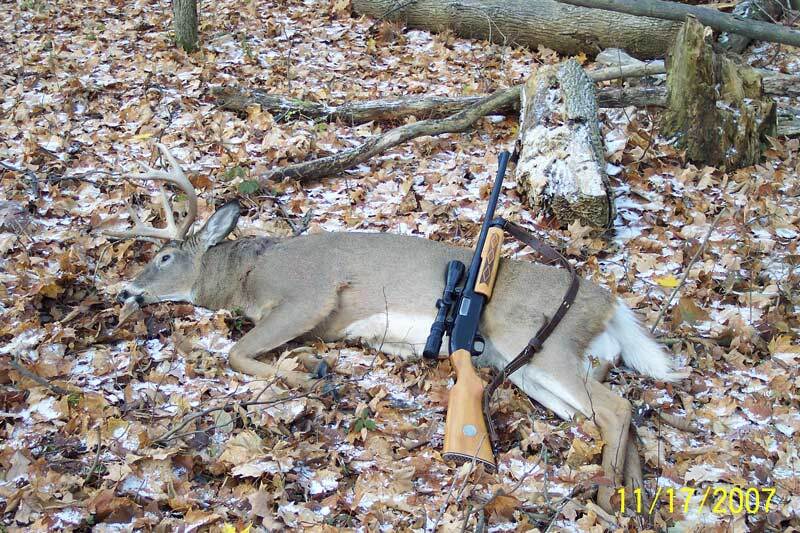 Opening day of the gun season for deer was a big event. Quite a number of senior students from high schools as well as people from the workforce from local businesses were noticeably absent on opening day. The traffic on the road in front of my in-laws' house was a steady stream heading south starting about 3:00 a.m. on opening morning. Over the years these hunter numbers have diminished significantly -- even more so than here in Ontario. The deer population, where we hunt in Unit 8N, has varied significantly over the years as well. The numbers have gone from high to low and back again from one year/decade to the next. I used to keep track of the number of deer I had taken in N.Y. but lost track quite a few years ago. Up until this season Unit 8N was a shotgun only unit. This meant that you could hunt deer only with a shotgun containing slugs. This year they allowed rifles as well. About 25 years ago they made it legal to hunt deer with a handgun. Up to that point you could only hunt small game with your favourite pistol. At that time I tried to get permission to bring my 44 Remington Magnum into New York State to hunt deer, but unfortunately they wouldn't allow a non-resident to have a handgun in the State. Brother-in-law Terry and myself have hunted together pretty much from the beginning. We even built a small cabin up on the mountain on his property primarily for bow hunting. In the first 25 years or so I hunted for a week or so in the later part of the bow season, and then a week or two into the gun season. At that time if you killed a deer with the bow in bow season, you could get another tag to hunt with the gun. Having your hunting area close to the in-laws is a big advantage in that I could hunt for as long as I wanted, because it meant that Cheryl could visit with her mother and family longer. The basic deer license, now $140.00 U.S. in 2013 for non-residents, is good for one buck. I have been buying these licenses for so many years that they go by my previous years' license to purchase a new one. Plus I have known the town clerk, where I purchase the license, for 30+ years now. For first timers, I assume it's the same now as it was when I bought my first license there, in that you just need to produce a hunting license from Ontario as proof of hunting eligibility. If you want to bow hunt you must take a special bow hunting course to qualify, and so far no crossbows are allowed in N.Y. for hunting. For antlerless (additional tags) years ago you could apply, usually with 1 to 3 other hunters depending on the hunting unit, in a lottery for one additional deer tag. For the past quite a few years they have been giving out extra doe tags like they were candy. When you buy your buck license you can pay an additional $10 and get two additional doe/antlerless carcass tags. Again this information is for Unit 8N as I cannot speak to the allotment of antlerless tags in other units. This means you can kill up to 1 buck, and 2 does or any deer that has less than 3 inches of antler. These additional antlerless tags are also transferrable. There is a transfer place on the bottom of the tag where the original owner can sign to okay the transfer of the tag to another hunter. Another difference from here in Ontario is there is no party hunting; you cannot kill someone else's deer. Having said all that, there are many, many fond memories of deer hunting in N.Y. -- far too many to go into here. Until last season here in Thunder Bay, the largest buck I had ever taken was in N.Y. in 1988. The mount of this buck is on my wall here in Murillo. As I recall, I had just crested the top of the mountain when I spotted two does. I picked the largest one of these two and dropped it with my trusty Winchester slug gun. As Terry and I were standing over the carcass and I was thinking I should start field dressing it, something caught our eye just over the ridge and down the mountain from where we had just come. I decided that the field dressing could wait for a bit and proceeded to sneak down the ridge a little to see what was there. After about 80 yards or so I came upon the buck coming up the mountain just on the other side of the ridge I was on. He didn't even know I was there, and when he crested the ridge he was only something like 17 yards away. He stopped broadside in behind some large oaks that covered his head and chest areas. The only feasible target I had was his neck, but when I pulled up the gun and looked through the scope all I could see was brown hair. I lowered the gun to put the scope down to 3 power so I could get a good fix on the centre of his neck. The rest is history.... I brought them both home in the trunk of a Plymouth Reliant to Bond Head, Ontario where I lived at that time. Needless to say, the trunk lid wouldn't close. I got lots of thumbs up when I was travelling in N.Y. but when I crossed over the border it seemed like I was someone from outer space as I received only a lot of strange looks and glares. In those days there was no problem bringing a deer carcass over the border into Canada as long as it had a valid N.Y. carcass tag on it. It was considered a "hunters' trophy" and was not subject to any duties, taxes, or otherwise. In the past quite a few years I have left the venison for my Mother-in-law as I have enough here at home, so I'm not sure if these rules still apply. As for taking a firearm into N.Y. prior to 911, you just put your slug gun and ammo into the trunk and away you went. Since then you must fill out a form (available on line) for the Alcohol, Tobacco, and Firearms (A.T.F.) people in the U.S. well in advance of going hunting -- I would say at least 2 months. Before you do this you must purchase a hunting license in the US to be used as evidence of a valid reason for bringing a firearm into the U.S. If approved, you receive the completed form back from the A.T.F. stamped and signed. This is the legal document you must carry with you while travelling into and while in the states. I believe this form is good for 12 months. Once you jump through these hoops you are good to go. All you need is to find some huntable "state land" or make friends with some farmer/landowner and get permission to hunt on their private land. 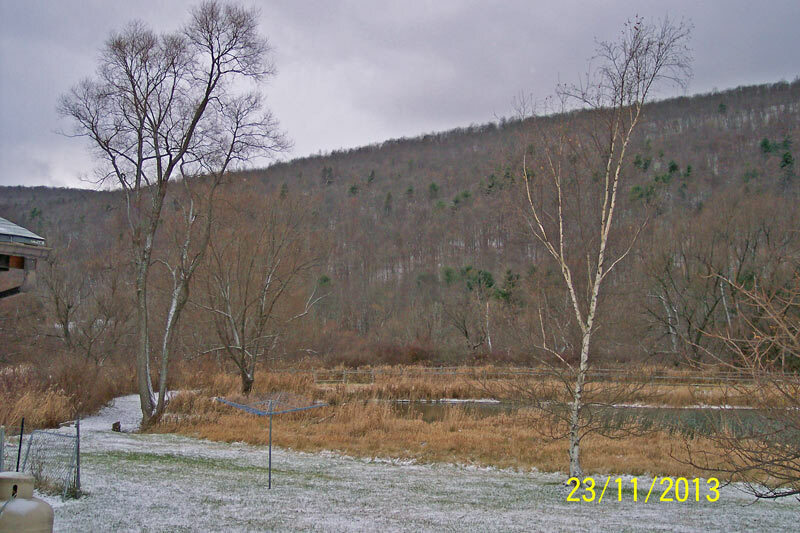 Where I hunt in the Finger Lakes area the scenery is quite nice. Much different from here (boreal forest) in that the woods are mostly oak, maple, ash, etc., with a few pines and spruce mixed in. There are also a few patches of swamp and in certain areas what they call thickets. Needless to say these mature deciduous woods are quite open and easy to see in. Again, unlike the thick boreal forests here. 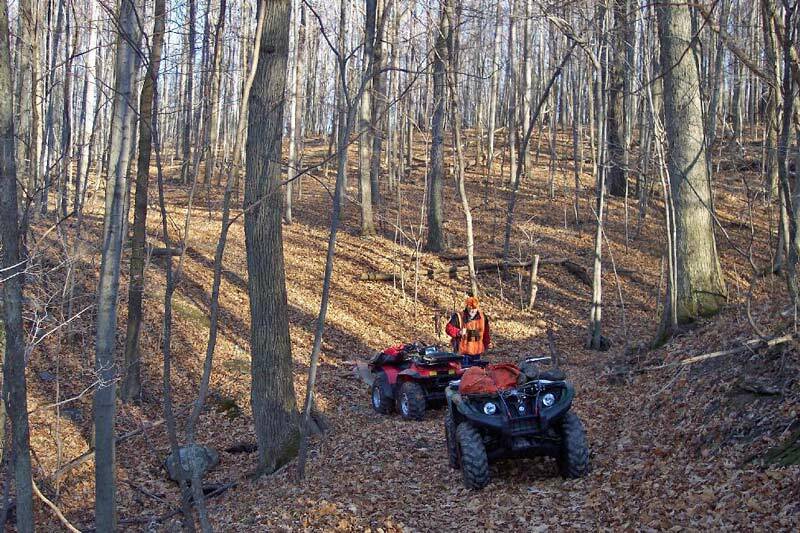 Copyright © 2013 New Ontario Shooters Association. This site is copyrighted and no content may be reproduced by any means, including electronic, without written permission except for strictly personal use. Other websites wishing to post a link to this site are welcome to do so.